We really had a strange summer. The whole media circus, and to a certain extent markets, clung to a few sparse green shots to decree “the recession over”. Which, according to the latest OECD interim assessment, is technically true: GDP in the EMU is forecasted to increase in 2013 by 0.4 per cent. Can we party, then? Well, no. It is now almost common knowledge that the roots of the eurozone crisis lie in the growing imbalances between core and periphery. Some blame the lazy southerners, some others point to structural flaws of the single currency. In both cases the current account imbalances that existed between savers and spenders at the outset of the crisis, are to be taken as the trigger. (Looking at current accounts is in my opinion also a way to disentangle the structural imbalances story from the “Berlin View”; but I already discussed this). In the figure I report the change in ranking between 2006 (the date of the first release) and 2013. 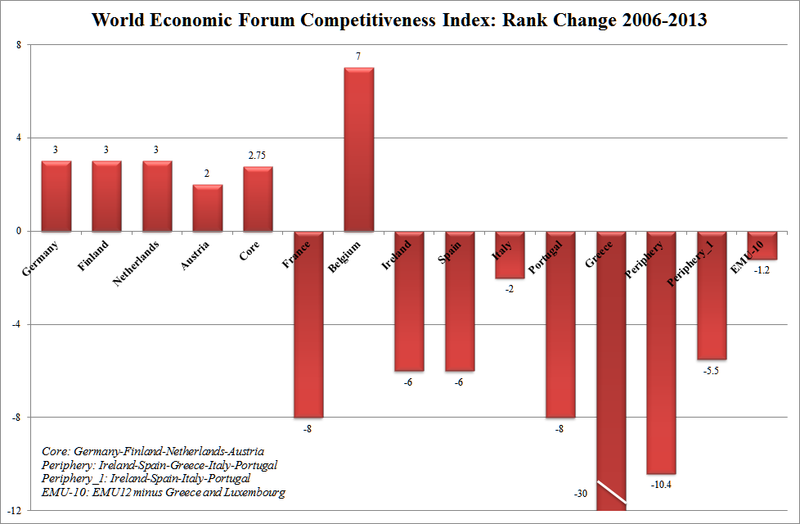 Germany for example is number four, while it ranked seventh in 2006. When averaging, I did not weigh (as I should have done) for country size. This is why I created the category Periphery_1 excluding Greece (that lost 30 positions since 2006 and biases the average for peripheral countries). Once again I do not want to emphasize the absolute position (it means little) but the change since 2006. All the peripheral countries lost positions and became less competitive, while all the core countries improved their rankings. This allows to assess the policies that have been followed during the crisis, and to take an educated guess on the future. The assessment is that austerity is not, as the proponents of the Berlin View would like us to believe, working to solve the periphery’s problems. The short term pain imposed by fiscal consolidation is not planting the seeds for a future recovery based on a healed economy and improved competitiveness. Rather the contrary, actually. The divide between north and south is widening not only in terms of current growth, but also in terms of future capacity to compete and grow. This should not be surprising. The right time for structural reforms is during booms. As for the educated guess about the future, it is also not very upbeat. The evolution of the GCI shows that the eurozone is exiting the crisis without having addressed the imbalances that caused it in the first place. This means that all the fragilities that we had in 2007 are still there, possibly even stronger. And if it is the case, it will be just a question of time before the uncompetitive peripheral countries start diverging again and the next crisis hit. None of the structural problems of an imperfect currency union have been properly addressed. The recovery is weak, very weak: even with the revised figures put out by the OECD, GDP in the eurozone is still more than two percentage points lower than in 2008. The pre-crisis peak will not be attained before 2015. Furthermore, the largest peripheral country, Italy, is still entangled in recession (-1.8% in 2013, according to the OECD); finally, headwinds are strong: the rest of the world does not seem to be in good shape either, with emerging economies struggling and the US that seem incapable to escape a jobless recovery. A special mention for France. Since the crisis exploded, back in 2009, it has been difficult to classify France. North or South? Core or Periphery? According to the figure, the answer is clear. France has lost 8 places in the ranking since 2006, and at least based on this metric, it seems to be drifting south towards the Club Med. Reblogged this on Arjen polku. I suspect these indices to be Granger-caused by actual economic outcomes. Which would fit in that case. That is a common superstition. If the periphery had not gone imprudently into debt (public, as in Greece, or private) the problem would not have arisen. What about treating that subject?